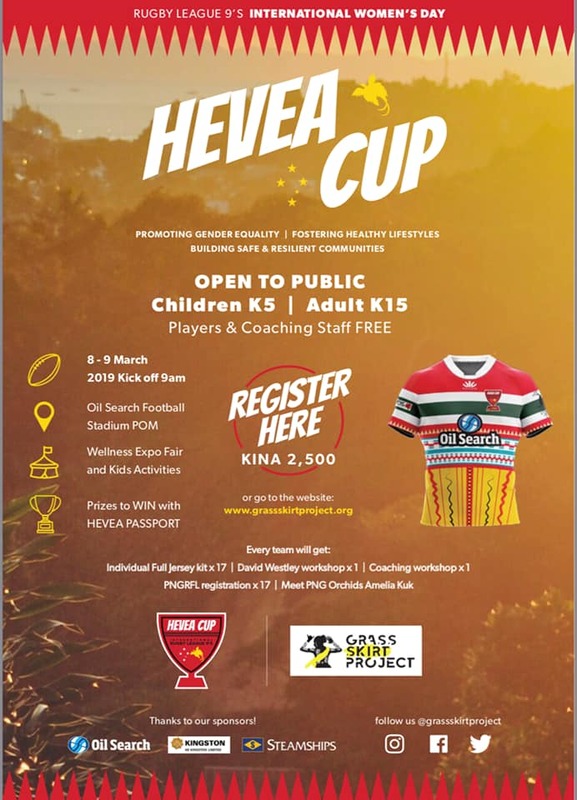 Grass Skirt Project are proud to announce the launch of the International Rugby League 9's Hevea Cup & Wellness Expo over March 8th & 9th to mark International Women's Day 2019 in Port Moresby, Papua New Guinea. Hevea Cup has partnered with PNG NGOs Oil Search Foundation, PAPUA NEW GUINEA TRIBAL FOUNDATION, Wantaim PNG, Marie Stopes Papua New Guinea, WeCarePNG, Susu Mamas Papua New Guinea Inc., Sustainable Coastlines PNG, PNG Olympic Committee AND MANY MORE to bring over 40 stalls, training and education workshops, special guests and live games, helping to make the Hevea Cup carnival & Wellness Expo a safe, inclusive environment for 24 teams of men and women to come together and play rugby league, while celebrating the vital role of women in PNG. On the day, players and spectators can pick up their Hevea Passport at the entry gate. Visit all participating stalls to get stamps in the passport and go in the running to win your share of K20,000 worth of prizes. 5 winners will be announced after the women’s grand final game on March 9th.